KRUDO Knives’ STRICK9 Folder stands out in a crowd of tanto blades. There are lots of tanto folders out there, but Louis Krudo’s design departs from the traditional by adding the thickness of a 3/16” blade with 4 separate grinds. STRICK9 sports the look and feel of a custom blade with a top grind, a blade grind, a tip grind and a spine grind that all add to its individuality. This beautiful blade angles to come to a strong, no-nonsense tip that you expect in a tanto. Elegant carbon fiber inserts lend to its simple beauty and outright toughness, making this the perfect EDC knife. STRICK9 Folder is Louis Krudo’s long-anticipated hybrid tanto blade. Folks have been asking for a tanto blade from KRUDO Knives for some time now. You asked we listened. The styling and symmetrical look lends itself to complement any EDC carry. Tailoring of the handle lines makes STRICK9 hit the sweet spot in your hand. The thickness of the blade instills confidence that this knife will breeze through your workday right along with you. We say, “Use it!” We make our knives with you in mind and we intend for them to be put through their paces. The STRICK9 Folder is no exception. Krudo designed this tanto with his own flare. The angled tip and multiple grinds allow for maximum utility for slicing, puncturing and just plain cutting. No package or box stands a chance with this knife in hand! Ceramic ball bearings create a smooth opening and front flipper for an alternate opening method. The Thumb Wedge, as seen on nearly all of Louis Krudo’s folder designs, puts your thumb in natural, ergonomic positioning and allows for a lightning-fast out of the pocket opening. These describe two of the 5 ways of opening this knife. See Louis Krudo’s videos demonstrating these openings. I received MY STRICK 9 EARLY as a pre order and I live it. Krudo = SOLID-ATTRACTIVE-BEAUTIFUL- FUNCTIONAL-AND A BLADE TO DIE FOR…ITS A TRUE 5 STAR KNIFE WITH A VERY COMFORTABLE IN THE HAND FEELING. BIG hands will love it which is incredible because I have small hands and its fits just right. That can’t be an easy task to satisfy both ends if the spectrum. Absoultly get this knife and the other new offering REVOLUTE. I actually like the REVOLUTE more so you can imagine how nice that BLADE is !!! The STRICK9 is an absolutely gorgeous knife, from its modified tanto blade, down to its carbon fiber scales! I currently own 3 versions of the Krudo SNAG, so I was highly intrigued by the design of the STRICK9, a major departure from the reverse karambit look of the SNAG. The handle is simple, yet highly ergonomic. The blade is chunky, but not clunky…not unlike that of a cleaver only with a wicked tanto tip! The blade is easily deployed with the flick of the flipper and smoothly locked into place. An ergonomic thumb stud is supplied allowing a great grip, and doubles as a quick deployment notch out of the pocket! Closed, the knife features a small protrusion that can be used as a glass breaker or as a head knocker, depending on the situation. The knife has a sturdy frame lock and a reversible pocket clip. 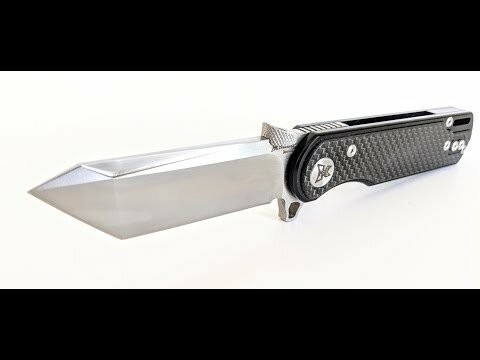 In my opinion, this is Louis Krudo’s most awesome design, as it is a straight forward and highly functional, no nonsense knife. My only recommendation would be that the flipper had some jimping to allow for better finger grab, but that aside…this is probably my favorite EDC. Highly recommended!